Not only is this exercise super fun, but it’s also an insane workout! Bouldering is similar to rock climbing, but it’s done without the support of ropes, which makes it even more challenging. Try it out at Rock Republic or Mountain Extreme. Ready to bounce those extra calories away? Bounce Fit is a high-energy workout on a trampoline that is said to burn up to 1,000 calories in one class! With instructors that don’t let you quit, pumping music and non-stop cardio exercises, this NASA-approved workout is definitely one of our favourites. Whether you want to learn how to fly or you’re planning on joining a circus, aerial silks is definitely worth trying out. This class will have you hanging mid-air, suspended from the ceiling by silk fabric. It sounds scary, but once you learn the basics, you’ll be swinging and twirling around the room in no time. If you haven’t tried a Prama class yet, you’re totally missing out. 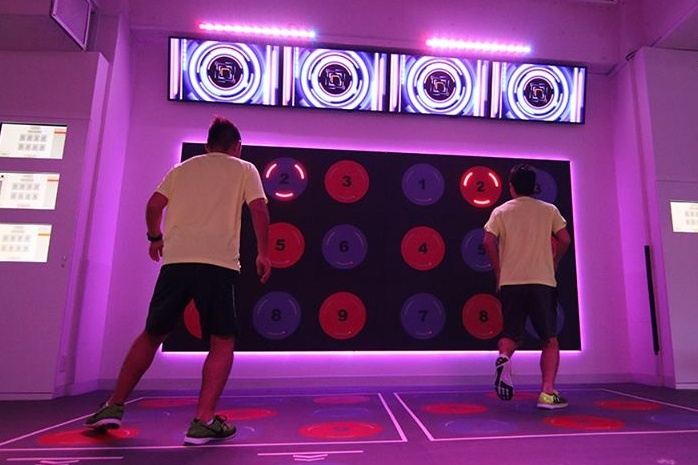 This high-intensity circuit class takes place in a dark room with LED lights, sensors and sounds to create an interactive experience. Trust us, this is one workout to try out in the new year.